​The term ‘‘tipping point’’ commonly refers to a critical threshold at which a tiny perturbation can qualitatively alter the state or development of a system (T. Lenton). This generally includes an abrupt irreversible climate system switch and an acceleration of change beyond the driving forcing (NAP 2011). We know of tipping ponts from the paleoclimate earth distant past and some models. However tipping point changes are 'not anticipated by climate models tuned to modern conditions' (NRC 2011 Summary). ​The report ‘Major Tipping Points in the Earth’s Climate System and Consequences for the Insurance Sector’ indicates that the world’s diverse regions and ecosystems are close to reaching temperature thresholds – or “tipping points” – that can unleash devastating environmental, social and economic changes, according to a new report by WWF and Allianz. James Hansen has addressed the enormous danger of tipping points in one of his lectures (2009). 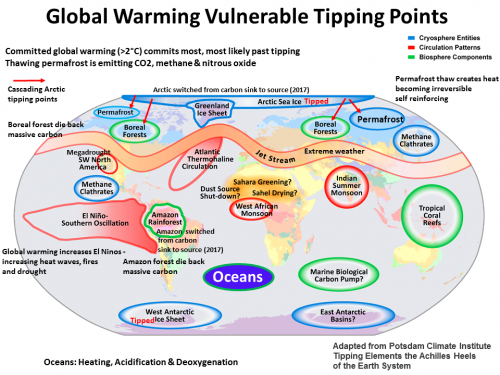 "​​Here are several climate tipping points of special concern. Tipping points are “non-linear” phenomena, which means that they can reach a point at which rapid catastrophic change occurs. It is inherently difficult to determine the time at which non-linear collapse will occur, even in cases where such rapid change is certain. Ice sheet disintegration The mechanism seems to be most important for disintegration of the great ice sheets that cover Antarctica and Greenland begins with ocean warming. Ocean warming leads to melting of ice shelves, which are tongues of ice that stretch out into the ocean. The ice shelves buttress the ice sheets, so when ice shelves disappear the more mobile parts of the ice sheet, the ice streams, can surge into the ocean – thus removal of the ice shelves is somewhat akin to taking the cork out of a bottle – it allows the material behind to flow rapidly. We know from Earth’s history that once ice sheet disintegration is well underway, sea level can rise by several meters per century. Species extermination is also a non-linear problem. Today we are placing many species under multiple stresses, but one stress that is growing rapidly is the shifting of climate zones due to global warming. ... Because of interdependencies of species, the loss of key species can cause entire ecosystems to collapse. global warming, if that warming reaches a level, a tipping point, such that large volumes of frozen methane begin to melt." 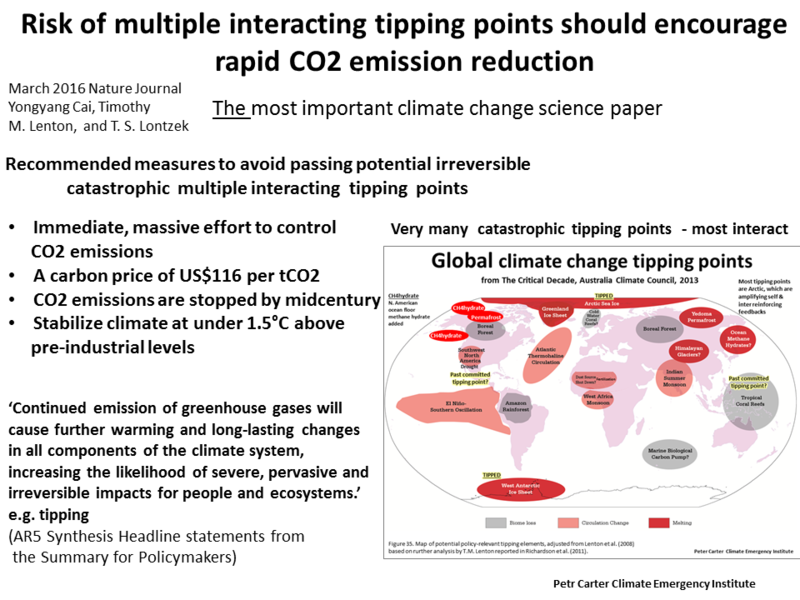 The research on tipping points is directed not at compelling governments to curb emissions on an emergency basis, but to look for early warning indicators of tipping points. It is intuitive that there won't be early warnings and even if there jt would far to late to ​stop or slow the warming. 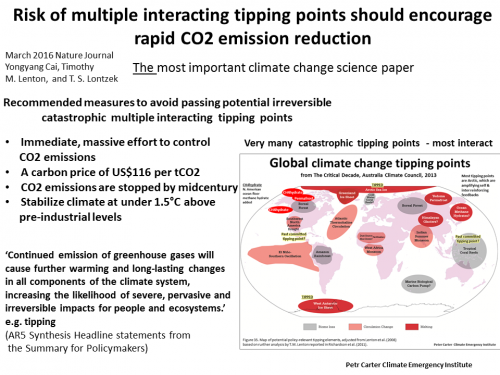 A 2010 study on ​tipping points: Early warning and wishful thinking finds that they have very limited predictability. The worst tipping point would be an abrupt large increase in global temperature. This paper takes the ice core abrupt warming events and finds no early warning indicators. Like James Hansen, Andrew Gliskson finds from the ice core distant past that the planet tends to warm abruptly and we have added too much GHG heat to the system for any security of avoiding tipping points. Trends and tipping point in the climate system: portents for the 21st century. Past and current trends in the atmosphere/ocean system Andrew Glikson Earth and Palaeoclimate science Australian National University. What has been little attention is the possibility of self reinforcing +ve feedbacks or multiple cascading catastrophes reaching planetary tipping levels for a megacatastrophe. ​​A Harvard discussion paper Responding to Threats of Climate Change Mega- Catastrophes does consider and how to respond to such a risk. This addresses the important question of rapid abatement and geo-engineering. 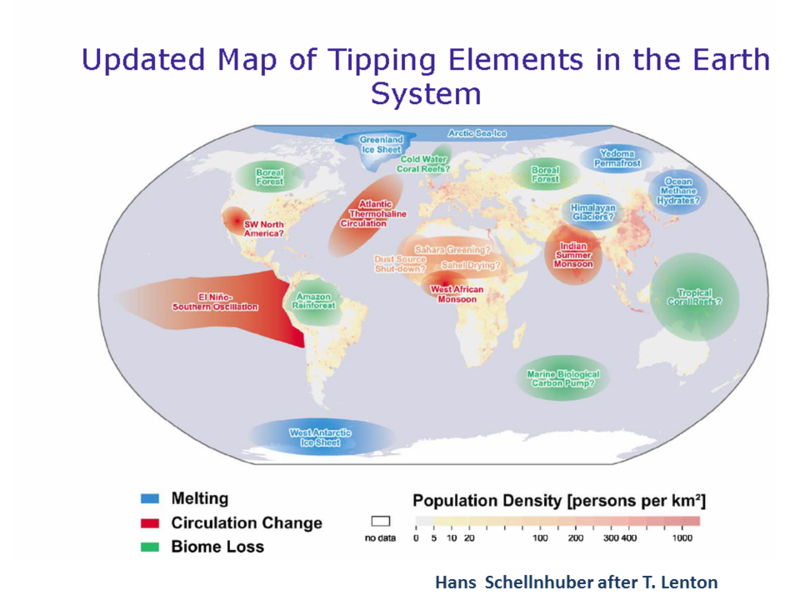 As there are many potential tipping and they inter-reinforcing ​​risks for a planetary catastrophe this alone argues for the development of the rapid planetary emergency response capacity. The ultimate tipping point caused by industrial GHG global warming would be so-called 'runaway' global warming/ rapid global warming, abrupt global change, irreversible global climate change, in the science terms. This is a self accelerating multiple amplifying (mainly Arctic) feedback situation. Research published on 30 July 2013 suggests that, though unlikely, this could happen. 26 June 2017​​ Evidence of "tipping points" turning climate change from gradual to rapid (NH +10C) abupt warming from slow rise in CO2).